Being a Mom on the go I am always looking for a nice large tote bag I can fill with either stuff to keep the kids busy, carry our towels to the pool or just for a quick trip to the store. 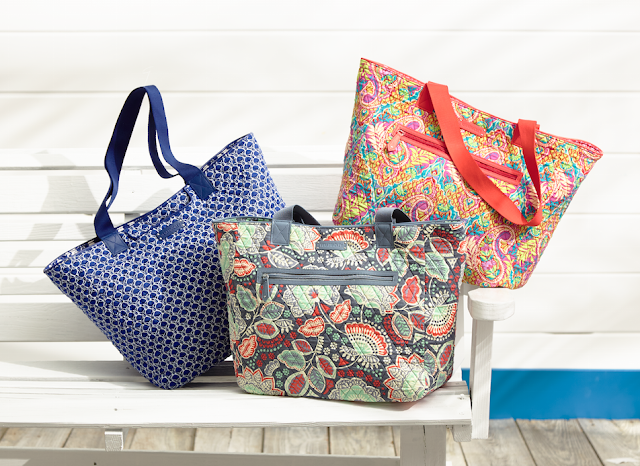 This Mother's Day treat Mom with the limited edition Vera Bradley for Win Reversible Mother's Day Tote . Vera Bradley and Macy's partnered to support Win with the Vera Bradley for Win Mother's Day Tote which is available in three reversible color ways including, Cobalt Tile, Nomadic Floral and Paisley in Paradise. Retailing for $88, the bag is available on Macys.com as well as in 40 Macy's New York Metro locations and on VeraBradley.com and select Vera Bradley stores with all proceeds benefiting Win. Kelly Rutherford was spotted on April 7th, carrying the limited edition Vera Bradley for Win Reversible Mother's Day Tote in Nomadic Floral while flower shopping on Madison Avenue, Upper East Side in NYC. The Gossip Girl alum and mother of two carries the special limited edition tote, supporting Win, Women in Need, an NYC based charity that transforms the lives of homeless women and their children by providing safe housing, holistic services and innovative programs to break the cycle of homelessness.